A cult favorite in Portland, Salt & Straw Ice Cream will soon be scooping sweets in Carmel Valley. Crafty. This is Salt & Straw's Peanut Butter Stout with Chocolate Chicharrón, a flavor made with help from Belching Beaver Brewery. This might be the sweetest news you hear today: Portland's beloved ice cream shop, Salt & Straw, is opening up a second scoop shop in San Diego. The popular ice cream shop, which already has a location in Little Italy, plans to open up a store in Carmel Valley's One Paseo in 2019. The store didn't elaborate with any further information. The family-run ice cream company is known for its handcrafted, small-batch scoops, in interesting, gourmet flavors like Sea Salt with Caramel Ribbons, Honey Lavender, Freckled Woodblock Chocolate and Almond Brittle with Salted Ganache. The recipes are made with all-natural cream from Scott Brothers Dairy in Chino, California, churned in small five to 10-gallon batches. The menu also features seasonal flavors, which rotate monthly, created with locally-sourced ingredients. To that end, the San Diego scoop shop includes flavors influenced by local artisans including James Coffee and Belching Beaver Brewery. San Diego-centric creations include “James Coffee and Compartes Love Nuts,” ice cream made with cold brew from James Coffee roasted beans mixed with Compartes chocolate-dipped caramel covered pecans, and “Avocado & Oaxacan Chocolate Fudge,” rich, creamy avocado ice cream featuring ribbons of Oaxacan chocolate fudge from La Guelaguetza Restaurant. There’s also the “Peanut Butter Stout With Chocolate Chicharron,” a crafty collaboration with Belching Beaver Brewery featuring the brewery’s Peanut Butter Milk Stout. The beer is poured into cream steeped with the same malts used to brew the stout. 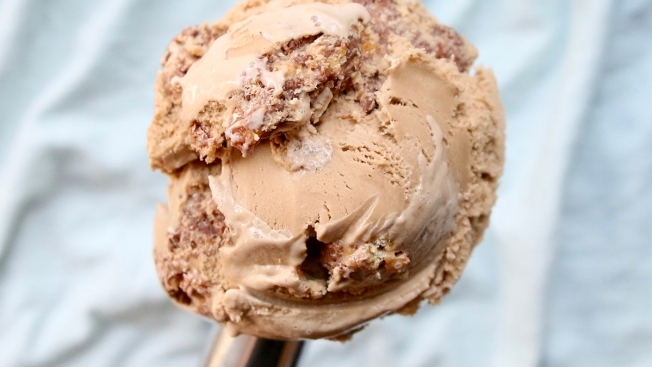 Pieces of dark chocolate caramelized pork chicharron are mixed in for a malty, salty, peanut butter-rich ice cream. Other flavors on the San Diego menu include “Roasted Berries & Toasted White Chocolate,” “Salted, Malted Chocolate Chip Cookie Dough” and “Double-Fold Vanilla,” to name a few. Scoops are available in cups or handmade waffle cones. Salt & Straw also offers milkshakes, sundaes and pints of ice cream to go. Home delivery is also available via Postmates. In the meantime, ice cream lovers can stop by the Little Italy location to satisfy their cravings. The India Street location is open daily from 11 a.m. to 11 p.m. At popular times, patrons can expect long lines as they wait for that sweet reward. Salt & Straw was founded in Portland by cousins Kim and Tyler Malek, getting its start in 2011 as a red-and-white striped ice cream cart. Today, Salt & Straw operates scoop shops in Portland, Los Angeles, San Francisco and San Diego.